I am chasing the USA Pro Cycling Challenge and blogging as a fan. Playing tourist in my own state of Colorado. I was at the start in Steamboat Springs where I picked up my press pass. 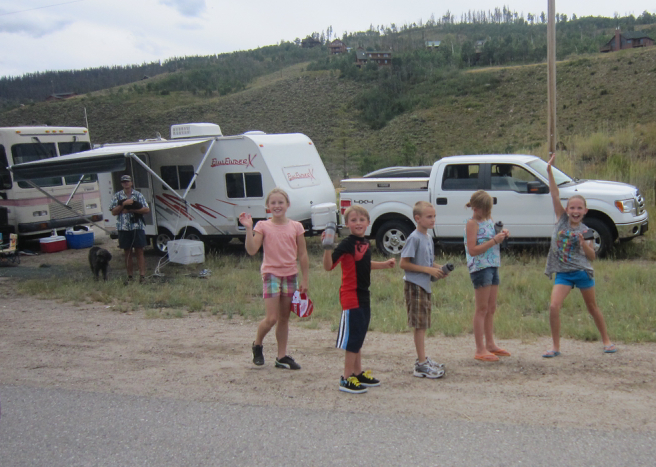 I watched the start then drove the race route behind the caravan into Silverthorne. I saw the race come by at the junction of Green Mountain reservoir and Hwy 9. 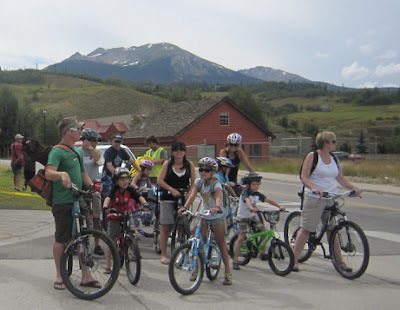 I then traveled to the finished in Breckenridge. I love being a cycling fan. I can explain exactly why. Because no two stages are alike and every fan has their own unique experience at the event. My favorite question I ask fans is, "where were you today?" Every time I hear a different answer accompanied by "we were in the best place." 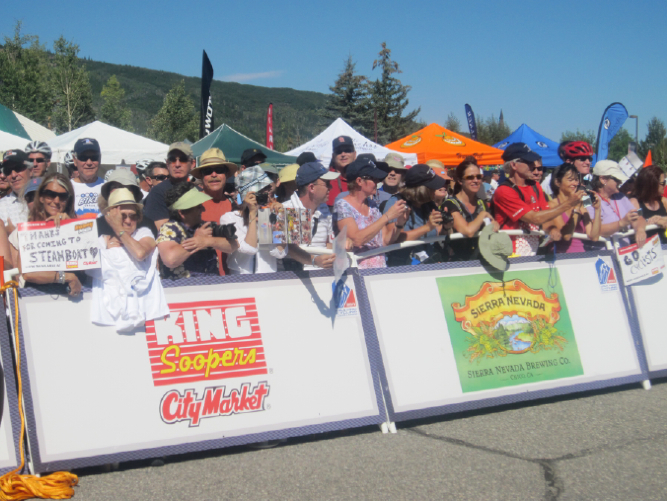 Apparently every place is the best place at a bike race. Think about it, if we attended a football game, we would all see the exact same plays at the same time. Our experience would differ only by the number of beers we drank or hotdogs we ate, and maybe which obnoxious fan was nearby, and the level at which we sat in the stands. In cycling the athletes are the same but every fan sees the game from an entirely different perspective and moment in time along the route. This is why you can chase Tours for years as a fan and never think you have seen it all. Today I cemented the fact that I love being a fan. 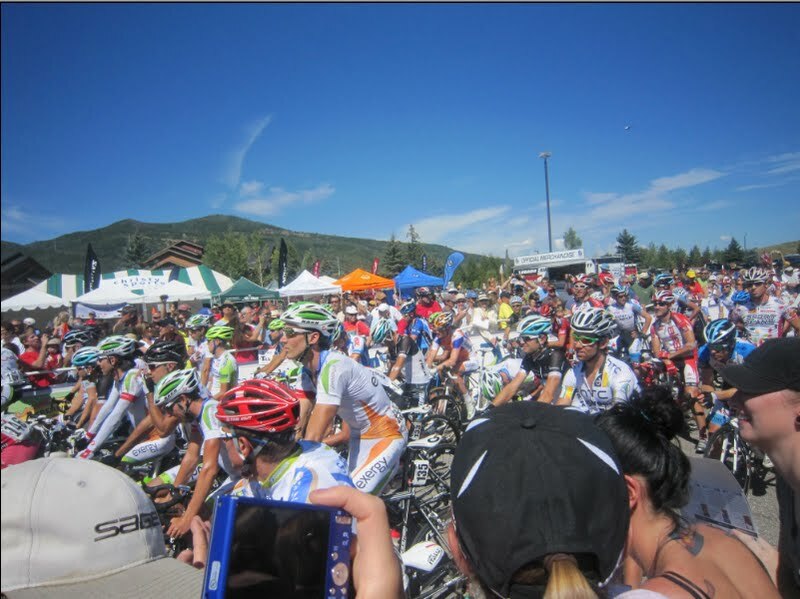 I had a dream come true today when I picked up my approved press pass in Steamboat Springs at the start of Stage 5. 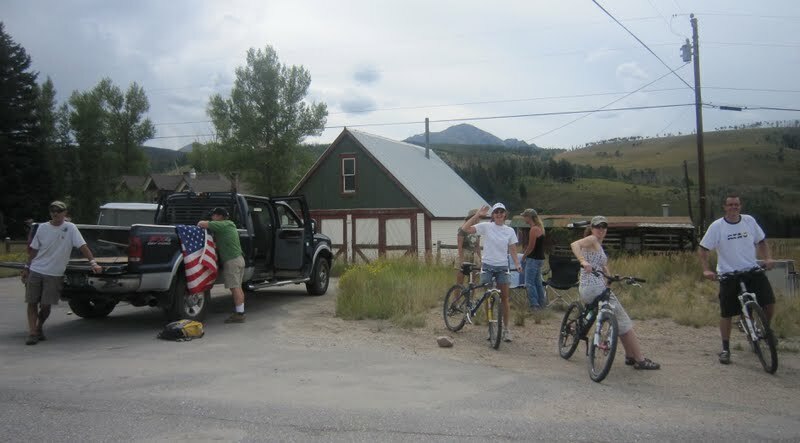 At first I tucked it away and played fan, collecting more signatures on my Colorado State cycling jersey. I got David Zabriskie, Tommy Danielson, Timmy Duggan, and Ted King. I then looked back and gave the fan behind me my spot near the railing. It was time to use the pass. I had such a wonderful time trying to capture the story of the fans getting signatures on Autograph Alley. From the inside near the start line, I looked mostly at the fans and less at the riders, a complete reversal of my usual role on the other side of the barriers. 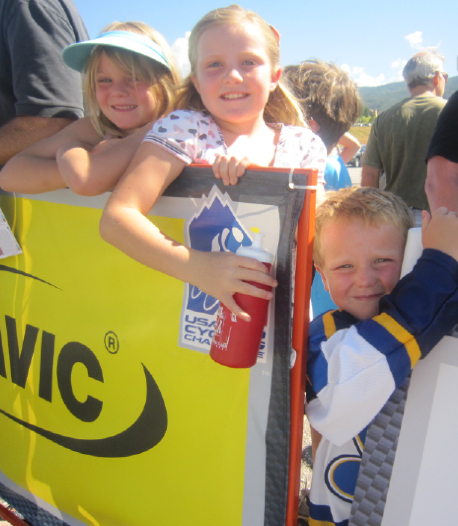 I was happy to see the riders being courteous and the fans having so much fun. Shortly before the race started I returned to the place where I feel best, 3-4 deep in the line of energetic fans at the barriers, yelling and lifting their cameras high to take photos. I thought, from now on I will always appreciate the sight of someone else's camera in my photo. It means that I am with my people, enjoying the sport that I love so much, with others who love is just as much. I looked over and noticed Ivan Basso at the start line a good 9 minutes before anyone else was ready to line up. In fact they were laying the start line over his back wheel. He had a huge grin on his face and looked like the kid who had slept with his baseball glove all night waiting for the big game. Basso was there to race a bike. I looked at him and smiled realizing - I think he likes it here in Colorado. Notice how Basso is all alone, that orange rope is the start line. Basso stayed there until Vladimir Efimkin rode by and said, "hey Ivan you want to go ride?" and off they rode until the official start. Actually Basso went back and chatted with Levi. I wonder what they were talking about? I noticed Eric Smith, the race coordinator of logistics and volunteers with Medalist Sports, being a fan himself at the race and that was insightful - once again we are all fans. I think this race has been supremely well organized. I chatted with Frankie Andreu today at the finish in Breckenridge. As you may have read during my Tour de France posts last July, I was a big ol' fan of Tour Talk with Frankie and James Startt on Bicycling.com. Their banter was a welcome relief from the oft boring sports interview. 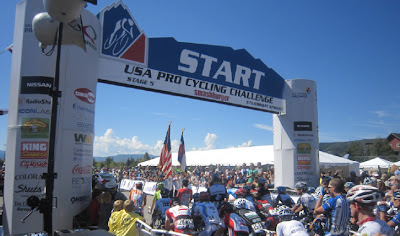 Frankie is involved in a series at the USA Pro Cycling Challenge called Race Radio. Today when I spoke with him, he enthusiastically recalled the Stage 4 cowboy video. Watch the series, they are entertaining and out of the ordinary for typical race coverage. ... but remember the pen! The fans with Oscar Sevilla. Look at all the smiles. George Hincapie is very popular! I watched the race depart next to this family who said, "they go so fast. They look much fatter on TV," and my favorite, "you would have to devote your whole life to this," the older brother said as he watched the riders and cars fly by. 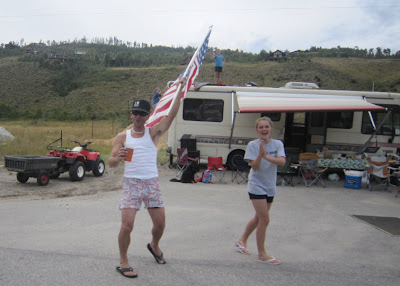 After grabbing a slice of pizza and a cold drink, I decided to go for it and headed down the race route to Breckenridge. 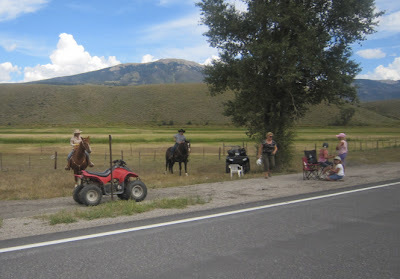 The ride was smooth and easy and I was thankful for the local ranch truck ahead of my small group of drivers going the speed limit entering Kremmling, because Lord knows I do not. Suddenly I saw flashing lights up the road and realized I was maybe 15 cars behind the race. Only it was clearly the preceding motorcycle cops whose duty it is to clear traffic from the road. We were stopped on Hwy 9 and the race was rejoining the highway after going around Green Mountain Reservoir. I got to see the Peloton fly by again! The drive from Steamboat Springs south to Breckenridge was spectacularly beautiful, the light on the mountains and ranges made the landscape sparkle under the dramatic skies. I kept wondering what the riders must have thought of the magnificent scenery on Stage 5. 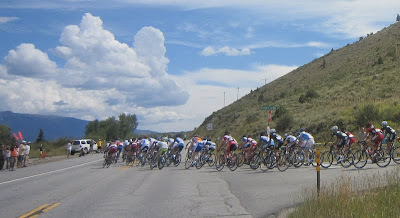 Then I watched this video of Jens Voigt commenting on the "breathtaking spectacular landscapes" of Colorado. The crowds were huge in Breckenridge with an excellent turnout on a Saturday. I watched at the Pearl Izumi booth as they added the new team logo onto the most aggressive rider jersey that Andy Schleck would wear on Stage 6. 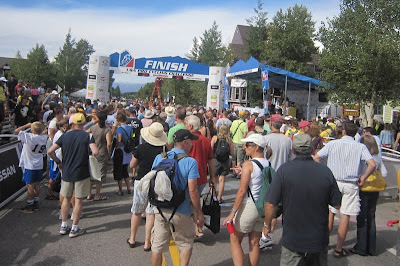 At the very end of the day, I ended up in the VIP booth in Breckenridge where I met Scott Christopher and Dash, plus some new friends and fans, and later chatted with Frankie Andreu about his series for the race called radio talk. I watched as the Race Organizer, Race Director, and Race Owners relaxed at day's end. More about these men behind the USA Pro Challenge in a previous post. Lastly I stopped by my old favorite restaurant, Giampietro's (I used to live in Breckenridge), and ordered some pasta to go. The wonderful smell filled the air as I drove east to Denver, happy to be back home but a little sad to leave the mountain glory. Now that I have my prized media pass, people are asking what I will do on my last day - volunteer! I committed myself to giving the last day of this Tour as a volunteer and I intend to keep that commitment. However small my duty, I will do whatever I can to ensure this race continues here in Colorado. Besides as I stated above - every stage is different - and this will certainly be different. Plus I still get to see the fans enjoying themselves. Especially with me pouring alcohol. Denver get ready for one massive event tomorrow.